If you are a fan of boxing then odds are that you are fan of Muhammed Ali. What Pele is to Soccer,what Jordan is to Basketball,Tiger Woods is to Golf, Ali is to the world of boxing.Undoubtedly Ali is the greatest boxer the world has seen till date. Possession of Montegrappa’s special addition on Ali would be a great collection item that would look just awesome to any collector . The design of the pen reflects elements of Muhammad Ali’s career as a professional boxer and celebrity boxer.The limited edition pen also addresses key elements of Muhammad Ali's life. 1942 is the year of his birth. He fought 61 fights. He won 56. His wins by knockout numbered 37. Inspired by these astonishing figures, Montegrappa has created 1942 fountain pens and 1942 roller balls in resin with sterling silver trims, 61 fountain pens with solid gold trims and 56 roller balls with solid gold trims.That’s a quite impressive figure for both Ali and Montegrappa. The barrel bears the colors of his boxing shorts in white pearlized resin with black stripes. The solid gold clip is reminiscent of the stitching on Ali’s boxing gloves. The cap’s profile follows the arc of a speed bag, crowned with the squared shape of the “World Championship” diamond-encrusted ring worn by Ali. Ali's signature is found on the cap, with the legend “The Greatest of All Time” engraved around the top. The pen has been crafted with amazing craftsmanship and the best part of the entire pen (atleast my favorite ) is the nib, with its gold inlaid silhouette of the classic Ali pose with his hands raised in the air. Keep staring at those winning moments whenever you write with this pen. Also available is an exclusive "knock-out" edition, gold-trimmed and set with diamonds in the cap's end-piece. Only 37 in total this was produced with the client selecting either a fountain pen or roller ball. Each solid gold version will bear a number corresponding to a specific opponent and fight, the pen engraved with the fighter's name, as well as the date and location of the event. The year 2010 has been a exemplary year from Montegrappa in Limited editions. It saw the release of Montegrappa Alfa Romeo Limited Edition pen, Montegrappa St Andrews Links Limited Edition Pen being the top ones. It comes packed in a beautiful Gift Pack which secures the pen and gives it the collectors look and feel. Call out Customer Care executives (1-800-263-2736 ) for discount of these prices. One of the famous dialogue of the movie Cars is “Float like a Cadillac and Sting like a beemer” . Well its an adaptation from the fighting style of Muhammed Ali which he described in his own words as “float like a butterfly and sting like a bee”. I would rephrase it for Montegrappa’s special edition ,that the Special edition of this pen right now “writes like butter and sells like hot cake” . Get it before its all gone.. The name Mark Twain means many things to many people – it may conjure images of the Mississippi river; jog memories of mandatory school reading; or just remind us of one of the greatest writers to have put pen to paper. While it would be very hard to find anyone who did not know who Mark Twain was and what he accomplished, it is likely that most give little to no thought of his most important tool – his writing instrument. During the later years of his life, it was the Crescent fountain pen manufactured by Conklin Pen Co which became Twain’s instrument of choice. He enjoyed it so much that he became Conklin’s official spokesman in 1903. 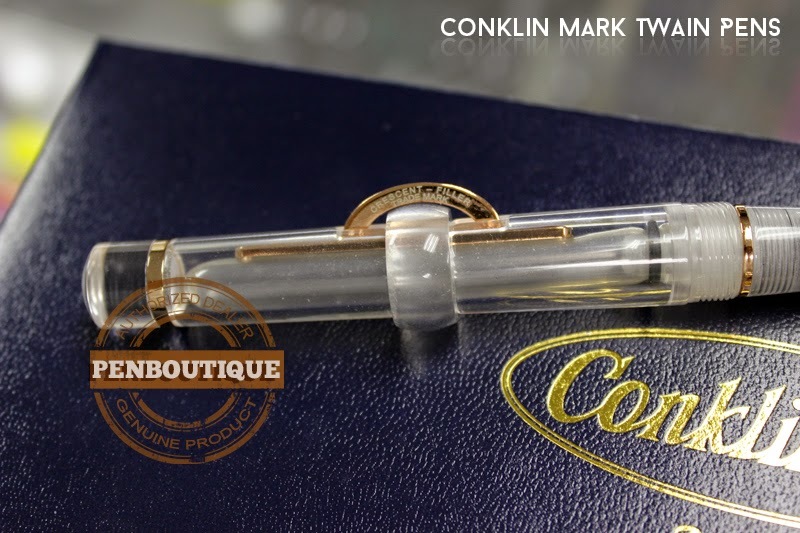 Conklin has continued to manufacture the Crescent fountain pen, now dubbed the Mark Twain Crescent Filler collection in honor of his patronage, to the same specifications as when it was available in the early 1900’s. The Crescent pens derive their name from the crescent half ring which protrudes from the body – rotate a safety ring so that a gap is lined up directly under the crescent, press on the crescent to deflate the bladder located inside of the body, release the crescent and ink will fill the bladder via suction – the safety ring is then rotated to avoid any spill issues. Twain’s appreciation of this particular pen was due to the half-moon crescent – it kept the pen from rolling off of his desk when he set it down. Conklin has created a Limited Edition transparent version to allow users to see the inner workings of the Crescent line. Available with either Rose Gold or Black Titanium coated metal accents, only 1898 pieces are available. This quantity was chosen as it was the year in which Conklin was founded. The limited edition number can be found on the metal ring at the bottom of the cap, right underneath the re-creation of Mark Twain’s signature which is present on all of the Crescent pens. The body and cap are constructed of a clear acrylic. The material from which the bladder is made is also transparent, which leads to a very clean appearance when empty. The nib on either version is stainless steel, with the Rose Gold in Conklin’s usual two tone and the Black Titanium coated to match the other metal pieces. It is available in Fine, Medium or Stub. The Medium nib is a smooth writer, with just a hint of wetness displayed with light to medium pressure. A little more pressure, like what you would find yourself using for a ballpoint, and the nib was wet enough to feather on cheap paper. The cap is light so it is not bothersome when posted. The safety ring located between the crescent and the body of the pen is graduated – it is slimmer at the gap and gets thicker as it goes around the body. This allows you to turn the ring so that it rests squarely between the two pieces and does not allow any movement of the crescent. My one caveat – if you are even the least bit OCD, you will find yourself continuously threading and unthreading the cap onto the pen until the clip lines up with the crescent, even more so with the transparent edition since you can see the nib! The Conklin Mark Twain Crescent filler line gives us the ability to experience writing with the same instrument used by one of the most influential and celebrated writers of all time. The crescent alone is a conversation starter, not even taking into consideration Mark Twain’s use. The pen itself feels like a quality piece and the nib provided a smooth writing experience. I like the Limited Edition’s transparency, though any of the Crescent line pens would work just as admirably. This is definitely a piece to add to your collection whether you’re a history buff, a literary fan or just fond of unique writing instruments. We have created a unique Sheaffer fountain pen androllerball set for the holiday. We chose the Sheaffer 300 which has a nice width and a good balance with a wonderful writing quality. The color we chose was the red ( like a marble finish) which will symbolize with the joyous holiday occasions. The packaging of the pen comes with a Sheaffer black box with Sheaffer dot logo. It has the Fountain pen, rollerball pen, 2 cartridges ( one black and one blue ) and one rollerball refill which is black in color. The fountain pen does come with the converter ( Sheaffer) and you do not have to buy another one. The rollerball pen has a nice balanced weight on it and has a chrome plated steel cap. The pen is a snap cap and has black refill in it. It takes only Sheaffer rollerball refill and the Sheaffer rollerballs write so smooth. The writings as shown in the picture do write smooth and on Rhodia meeting book that we used, it was a pleasure to write. It will make you feel like taking some notes in the meeting ( don’t know if it is going be meaningful but these notes might come handy some day!). The fountain pen is an identical twin to the rollerball pen. The Nib is a standard Sheaffer like nib – stainless steel with Iridium nib. Sheaffer steel nibs are sturdy and not flexible. The nib does write smoothly even for a fine point filled with the Pelikan Edelstein Green Adventura ink . For our test we used the fine point. The writing is surprisingly smooth even for a fine point. The fountain pen comes with a converter and can use cartridge also. Converter is included in the box and also a blue and a black ink cartridge. The cap is a snap type cap and snaps in and out nicely with a click. The clip is a nice big clip and has a sheaffer dot on it. Many of our customers have expressed their love for the clip. The final conclusion is that these are a great every day pen. You can use the rollerball to note down quick notes and then alternate with the fountain pen to cherish your writings or flow your ideas on to the paper. Either way these are great pens and value for the money . The 50% off sale is icing on the cake. These pens are no longer be produced from Sheaffer and hence our idea of making a set !!! Pen Boutique’s 10th Anniversary Special Giveaway Contest is now closed. Hence, we would like to put you all out of your misery and reveal the correct answer. Mount Everest is located in NEPAL. We would like to take this opportunity to inform you all that the contest received an overwhelming response and Pen Boutique is thankful to all the participants for their unmatched enthusiasm and zeal. We will announce the Lucky Winner of the contest shortly, who will get a Pelikan Mount Everest Fountain Pen, as promised. If you have submitted the right answer, then you might as well win this fabulous pen. Keep an eye out for a notification from us. Cheers!! In this fast paced world of new technology and busy days it is not often we get a reason to stop and reconnect to our traditions. Sending holiday cards allows us that excuse to connect. When carefully addressing aunt Betty's or cousin Bill's card we have the opportunity to not only use our best penmanship, it grants us permission to utilize our finest writing materials and ink. I enjoy getting into the spirit by using a red fountain pen and green ink. In the wonderful world of fountain pens there are many, many options of green ink to grace your cards and letters. Some of the most fitting green colored ink includes Diamine Evergreen, J.Herbin Vert Empire, Noodler's Polar Green, Montblanc Irish Green along with a multitude of others. One of my favorite descriptions of an appropriate green is the Pilot/Namiki Iroshizuku Forest Green: "It embodies the unchanging color of a dense evergreen forest in a long winter." I have found my perfect pen & ink combo to script my holiday cards. 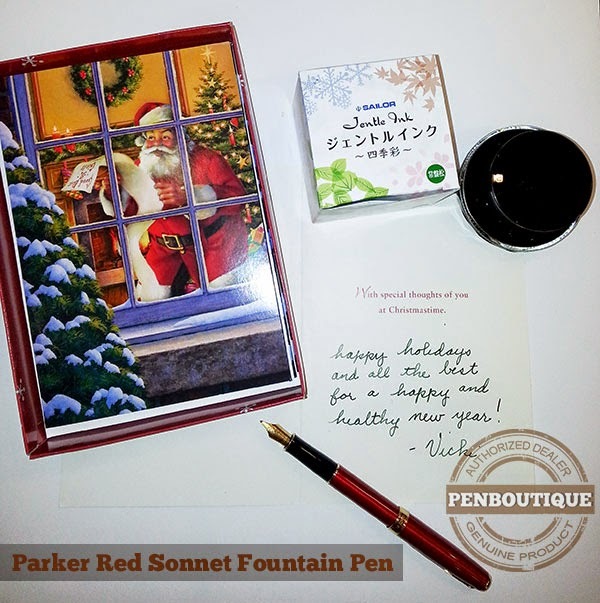 The Parker Sonnet red lacquer gold trim fountain pen and Sailor Four Seasons Special Edition Tokiwa Matu Green bottled ink fit the task with bells ringing. The intensity if the green and the easy feel of the Sonnet complement each other in an exacting manner. So take some time off from your baking and wrapping this year and choose the ideal fountain pen and bottled ink for you. If you realize that you enjoy the experience so much you decide to use it year long, for all your correspondence, your secret is safe with me. I won't tell Santa! The Tornado line has been and still is Retro51’s bread and butter. Offered in many different colors and designs, it is a workhorse pen that blends comfort and reliability. Each Tornado pen arrives with a capless rollerball, extended by twisting the rear knurled grip, which provides a smooth writing experience. The body of the pen is brass and is generally covered in lacquer or a design, after which a layer of protective clear lacquer is applied. The body tapers from back to front, with a clip protruding from beneath the branded ring at the back end of the pen. 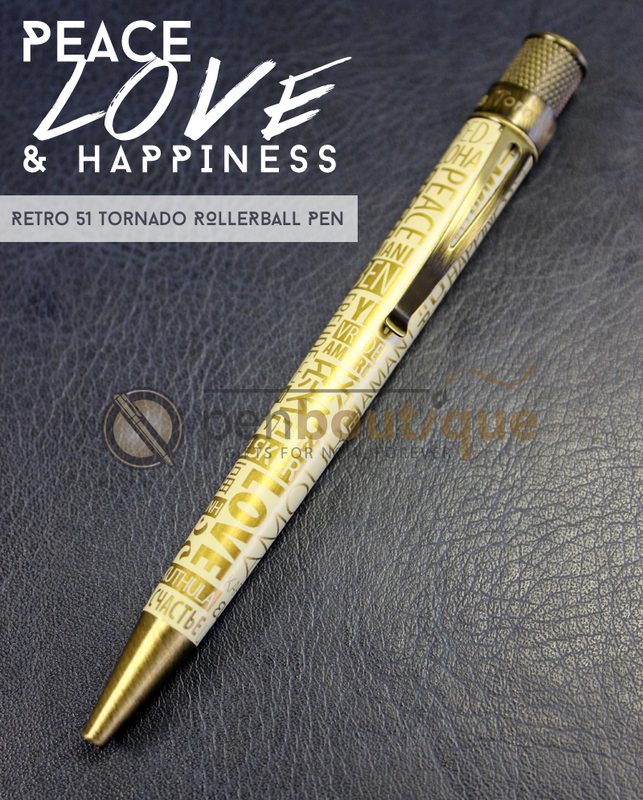 Retro51 has released a good selection of numbered Limited Edition Tornado pens and their newest is the Love, Peace & Happiness edition in a run of 500 pieces. This particular edition boasts an antique brushed look to all of the brass pieces, with the body covered in 25 different languages for the words “love,” “peace” and “happiness.” The words expose the brass body beneath a matte cream lacquer. This is a striking piece, helped in no small part by the antique brass accents. The limited edition number is engraved into the ring above the clip and is finished in the same matte cream color as the body – a nice touch as it can sometimes be hard to locate this number depending on its placement. The cream and brass complement each other very well. As with most of the Tornado line this piece has a nice weight to it – not too heavy, not too light – and feels very well balanced when in use. The diamond pattern grip at the rear makes it easy to extend and retract the refill. An interesting note is that if you have a favorite Parker style refill which you prefer over the capless rollerball that comes with the pen, the Tornado line allows you to switch between the two. This opens up the types and colors of refills that can be used in conjunction with these pieces. The Retro51 Tornado checks all of the right boxes – affordable, attractive, is available in many different colors and designs, has a good weight and feels good in the hand. Add to the equation that two different types of refills can be used and it makes these hard to resist. The Limited Edition Retro51s always go fast, especially since they are priced at the same level as the other pieces in the line. Whether you are a collector or an enthusiast, the Retro51 Tornado Love, Peace & Happiness is a great pen for just about everyone. 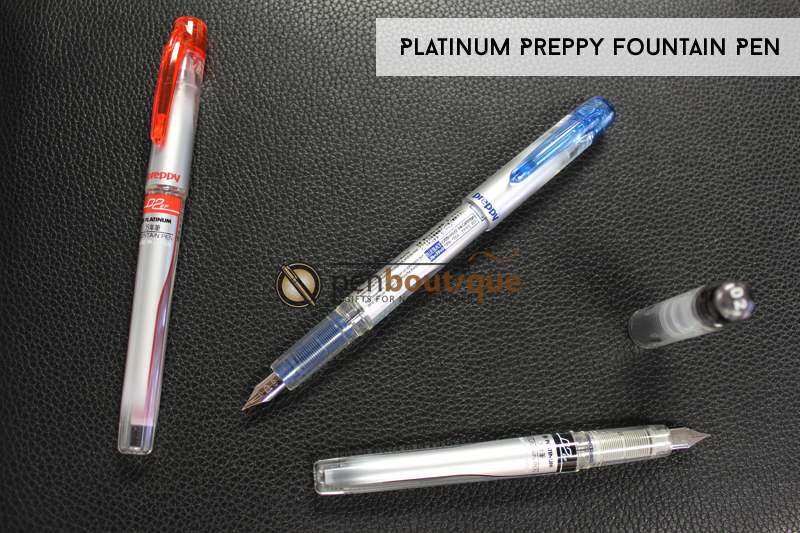 The newest Platinum Preppy Fountain Pen is here and ready for shipment. The latest choice is now an Ultra Fine, 0.2mm. It is available in Red, Black and Blue/Black. This is the perfect pen for sketches and taking notes. There was minimal scratchiness when writing with this pen. The price point is very reasonable for a re-fillable fountain pen. The variety of colors makes them great for drawing and the see-through barrels lets you know the exact ink level. The Preppy is still available in the Fine, 0.3mm, and Medium, 0.5mm. There is also the highlighter and marker options. The pens will work with a Platinum converter or ink cartridges. The ink cartridges are available in Black, Red, Pink, Purple, Blue/Black, Yellow, Green, Light Blue or Brown. The highlighter colors are Yellow, Blue, Pink, Orange or Green. The Preppy makes a great Holiday gift for under $10.00. The Graf von Faber-Castell Tamitio line brings the high quality and craftsmanship of the luxury brand to the affordable price levels of the workhorse Faber-Castell lines. It is an elegantly designed piece which is constructed of a metal body covered by multiple layers of varnish. This varnish imparts a matte finish which is non-reflective and smooth to the touch. The front section, rear section and cap are all polished metal. The nib is stainless steel and plated with Rhodium. The body has fluting which not only gives the pen a sleek look but also allows for a solid grip. The Tamitio is available in Black, Rose or Taupe and all share the same polished metal accents. It is offered as a fountain pen, rollerball, finewriter, ballpoint or mechanical pencil – the finewriter uses a felt-tip/fineliner type refill. The fountain pen includes a Graf von Faber-Castell converter, is compatible with short international cartridges and is offered with an Extra Fine, Fine, Medium or Broad nib. The attention to detail and finish on the Tamitio line really shine through on this piece. This is a weighty pen, no doubt due to the metal and varnish used extensively throughout the body. I found the fluting in the body to be both grippy and comfortable. The pen sans cap is weighted very well, and posting the cap did not throw that balance off too much. The Rhodium plated nib is very smooth, though the Medium was a little on the wet side for my tastes. I do like the black shield located at the top of the cap – it draws the eye and sets the logo apart from the silver colored metal. The nib unscrews from the front section, making cleaning extremely easy. From sight alone, the Tamitio fountain pen is unmistakably from the expert craftsmen at Graf von Faber-Castell. The lines of the cap and quality materials utilized are sure signs of this German manufacturer. The pen is a smooth writer, with a nib that is easy to use and easy to clean. 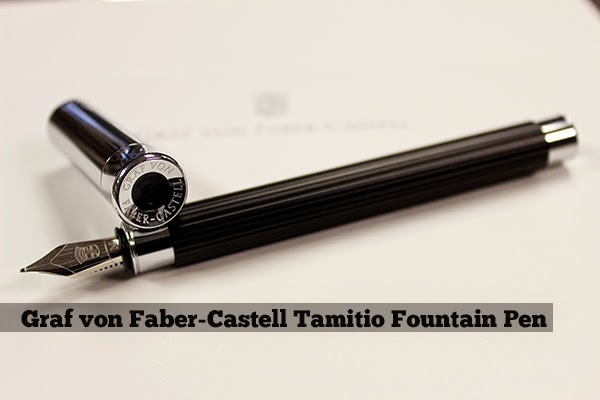 The Tamitio is an easy and affordable step up from Faber-Castell pieces into the luxury pieces offered by Graf von Faber-Castell. Jessica Lange once said, “Acceptance and tolerance and forgiveness, those are life-altering lessons”. When the UN General Assembly gathered the UN Member States in 1996 to pen 16 November as the International Day for Tolerance, their thoughts might have been similar to that of Lange. With wars blazing across the planet, especially in the name of faith and violence in all shapes and forms surfacing, the International Day for Tolerance seems even more significant today. Observed every year on 16 November, the day is dedicated to educating people about the negative effects of intolerance. It also tends to encourage tolerance and respect towards rights and beliefs of others, focusing on the negative impacts caused by injustice, oppression, racism and discrimination. Different activities are carried across the globe in different manners by different groups to celebrate the day. Educators write articles about tolerance while human rights activists organize events and speak on human rights law, focusing on banishment and punishment on hate crimes and discrimination. Secretary General of UN, Ban Ki-moon said about this day, " On this International Day of Tolerace, I call on all people and governments to actively combat fear, hatred and extremism with dialogue, understanding and mutual respect. Let us advance against the forces of division and unite for our shared future." But the actions inspired by this day should not be limited to the day. The day is to advocate and inspire others, while the rest of the 364 days are to work for a tolerant community, city, nation and most importantly a tolerant you. So, let’s join our hands together for a more tolerant society, so that we and the future generation could live in a more harmonious and peaceful society. 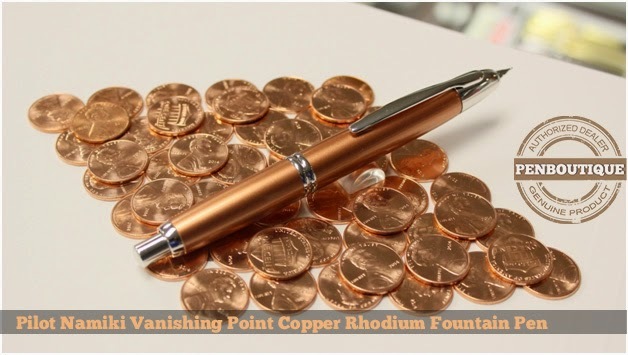 Meet Pilot’s newest addition to the Vanishing Point line, the 2014 Limited Edition Copper. I had been admiring the Vanishing Point pens for a couple of years now, waiting to see if they would come out with a model that I couldn’t resist. As bright as a shiny new copper penny, this pen really called out to me. It is almost as much fun to just look at as it is to write with. The 2014 Copper pen comes with rhodium appointments on the barrel and clip and a rhodium-plated medium 18k gold nib, which I found to be a little wetter than I had anticipated and could possibly be too broad for some writers who are used to the finer points of most Japanese pens. Inverting the nib allowed me to write in a finer font than when holding it in its normal position. This pen is an absolute joy to write with when partnered with a smooth writing paper, such as Clairfontaine or Rhodia. Since I use my fountain pens for both writing and drawing I was elated to find that the 2014 Copper is not too heavy to hold for long periods of time. This pen would be a great gift for any collector on your Christmas list. Even if that collector is you! The Taccia brand first came to my attention with their Savanna line of buffalo horn pens. 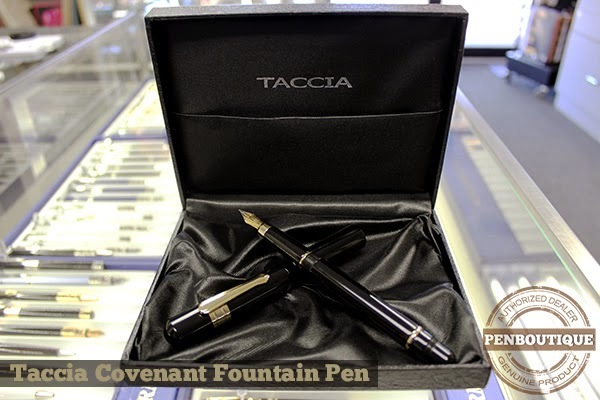 This is a unique pen, and Taccia has kept that uniqueness with the Covenant series of fountain pens. The first thing that comes to mind when looking at this pen is a cigar. The cap, which is more of a sheath than anything else, covers almost the entire length of the pen itself. When posted, only the front section of the pen is visible; when capped, only the rear section can be seen. It is a very interesting design, as the elongated cap has now been repurposed – Not only does it protect the nib, but it protects the body and is more like a carrying case than a cap. The pen can be used separately or in conjunction with the cap. Taccia offers three colors – Jet Black, Midnight Breeze or Parchment Swirl – with either a Fine, Medium or Broad nib. The body and cap are made of hand-turned resin and the two tone nib is flexible and made of stainless steel. A converter is included, or one could use international size cartridges if preferred. A retractable ballpoint is also available in the same three colors. The Covenant is an interesting pen – upon first look, the posted cap makes the pen look like it would be too unwieldy to use comfortably. However, I found that the large cap fit very well between my thumb and knuckle joint, with the leading edge of the cap resting on the meat of my thumb. That being said, it does feel a bit heavy in the rear when used this way, so I found I preferred using the pen sans posted cap. The pen itself is weightier than it looks, likely due to what looks like a good amount of metal in the front section as well as some in the body. While flexible, the nib did not give as much line width variation as a Noodler’s Ink pen would. This is certainly not a knock on the nib and if you’re not interested in one that is ultra flexible, then this performs very well. The pen feels well constructed and ready for every day use. One caveat if you are posting the cap – unscrew the pen by gripping the threads. If you have screwed the body in too tightly and grip the front section, you will end up unscrewing the front section only and leaving the body in the cap. While the posted look (or even the capped look) may not be for everyone, the Taccia Covenant should not be ignored if looking for a new fountain pen. The cap is a value-added feature, since it doubles as a protective casing for the pen itself. In hand, the pen performs very well – it is comfortable, of a good length and girth, and imparts a feeling of quality while in use. Style-wise the Covenant is a no frills affair that would be at home next to a Churchill cigar, right down to the clip “band”. If you want a unique piece that writes well, or even just a weightier resin pen, then take a look at the Taccia Covenant. And everything is all right. That time of the year is nigh, when we celebrate not only the miraculous birth of Christ, but also life, love and family. Christmas is just around the corner, and as Christ brought us the gift of life, we are prone to gift others good things, for the sake of giving. And since, giving is better than receiving, we bring you a list of cool items that you will rejoice giving others, this holiday season. Getting a gift for men, whether it is your father, brother, friend or a significant someone is very difficult. 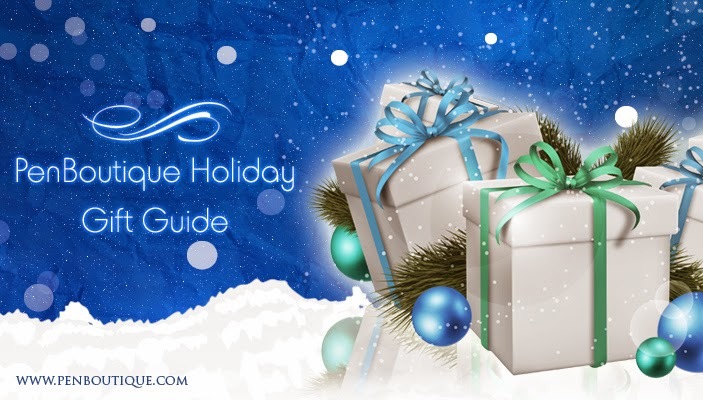 The search gets even frustrating, with the holiday season breathing warm air on your neck. To rescue you from the heated, messy affair of buying the right gift for a man, we bring you a list of favorable gift options below. Choose wise, choose as you please. Cufflinks make for a great gift for any hard working man, who cares about his appearance. And even if the receiver is your brother or a friend, who is yet to tread the white collar world, cufflinks can be a thoughtful and useful gift. Raise the bar and go for something exclusive such as a Visconti Bridges Carbon Graphite Cufflinks and Montblanc Silver Oval Rhodium Plated with Black Obsidian Cuff Links, or you can also get cufflinks that cost less than $100. 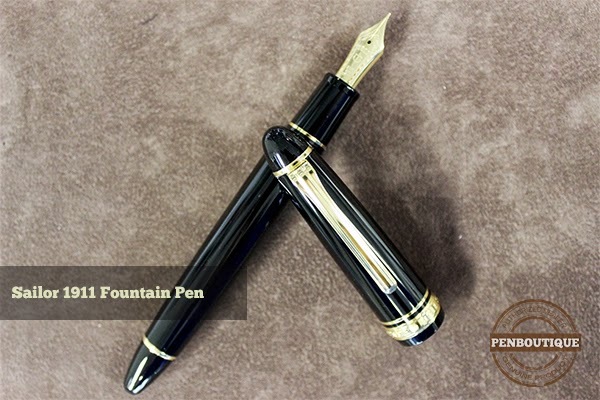 A good fountain pen has always been a trademark of rich legacy and education. Gift a fine pen to a man and he will value it forever. A gorgeous pen from noted brands such as Montblanc, Visconti and Parker is sure to add an added flair to this entire gift affair. If you are aware of something he has been eyeing on for a while than your job is made even easier. If not, try to dig out information of his idol. Pen brands keep releasing pens designed after famous people. With luck, you will find what he would cherish. This is the easiest or the laziest gift to give a guy. I say easiest, because every guy needs it, and laziest because we assume every guy needs it and end up buying the first, cheap wallet in view. But it doesn’t have to be so. Make an effort to know the preference or need of the receiver and shop accordingly. Brands like Bosca, Burberry and Cross might be your saving grace. If you have the bucks, then wristwatch is the probably the second most common gift for men. They like it; they use it, and watches make for a smart, stylish and sophisticated gift. Find a stylish one from Montegrappa and Tissot, and surprise the man in question. Buying a gift for a girl can prove to be tricky. What you think she wants may not be the thing she really wants, and vice versa. So, the best thing to anyone can do when choosing a gift for a woman, whether mother, sister or the significant other is to really know what she really likes. But in case this is a last minute shopping and you cannot figure out what she likes, then here are some surefire gifts to keep her gleaming with joy. Ladies love clothes, whether they are shopping for it or receiving it as a gift. Why not make her happy this holiday season with a warm cashmere or pashmina scarf, shawl or gloves. Sweaters aren’t a great idea, here. Show some warm love in the cold winter! Pens make for a safe option as gifts for women, but a savvy-safe gift. Depending on who you are giving it to, pick an inexpensive pen or an expensive pen. But we ask you, not to be a penny-pincher. Spend a few extra bucks on a fine pen for the lady and it will be appreciated. If anyone cares, I have dibs on the Caran d Ache Dunas Shiny Red Fountain Pen. Thank you! What kind of woman doesn’t like jewelry? Occasion or not, a woman loves to be showered with jewelry. Earrings, finger rings, necklaces and what not. Just make it real and she will love it. A hardworking woman needs a spa day, any day of the year. Whether she is a stay-at-home mom, or a CEO of a multi-national company, she deserves a break for doing everything she does. Buy her a spa day, filled with full-body massage, manicure, pedicure, sauna, Jacuzzi and what not. Trust us she will enjoy every bit of this gift. And on second thought, maybe this gift isn’t so bad for men too. After all, they deserve a relaxed day too. 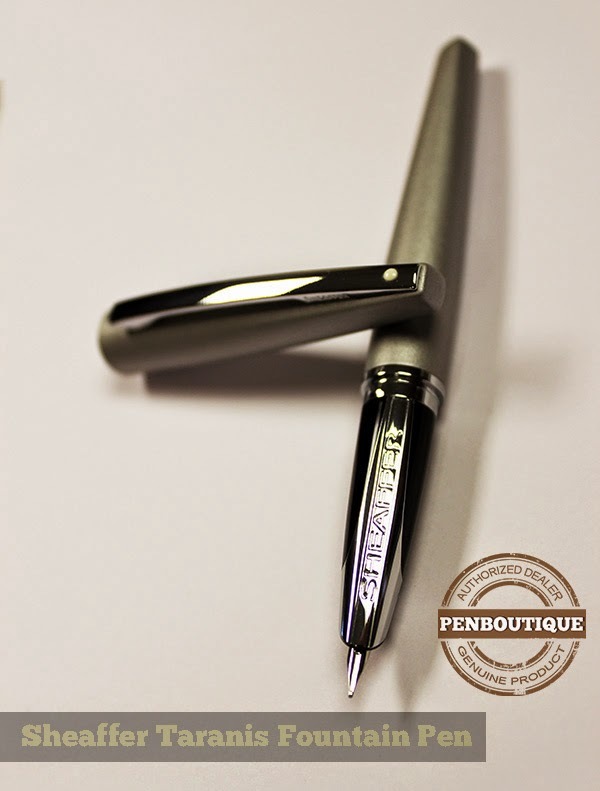 Pen Boutique 10th Anniversary Special Giveaway Contest !! In which country is Mt. Everest located? Name the country where Mt. 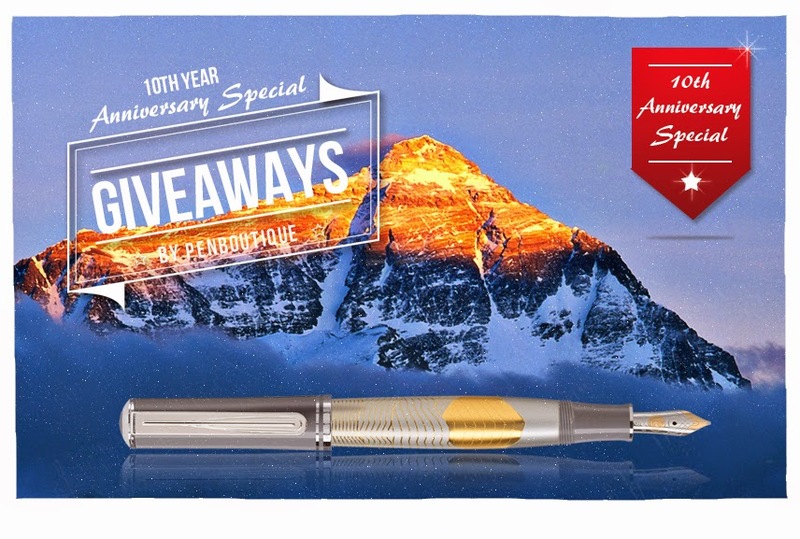 Everest is located and win Pelikan Special Edition Mount Everest! 1. Answer the contest question correctly. Do you know where the world’s highest summit is located? Pen Boutique is 10 years old. To celebrate this joyous occasion, we bring to you yet another chance to win an exotic writing tool. As Pen Boutique strides ahead to reach the top of its game and provide the best service in the world of pen purchase, we want to give our valued customers and well wishers an opportunity to land their hands on a very special pen - Pelikan Special Edition Mount Everest! To win it, all you have to do is tell us the name of the country which houses Mt. Everst - the highest summit of the world. Mt. Everest is 8,848 m high and is located in the country which houses seven other highest peaks of the world; take the hint. Be a part of our 10 years celebration, answer this simple question and if you win, celebrate with the Pelikan Special Edition. We encourage all our customers, well wishers and followers to take part in the 10th Year Anniversary Special Giveaway Contest. Out of all the participants with Correct Answers, One Lucky Winner will be chosen randomly by the system. The name of the winner will be declared in the contest spot as well as she/he will be contacted through the Facebook profile used to participate. Free shipping to Winners within USA. International participant shipping will be additional and you can also add it free to your any pending orders. All USA citizens with valid Facebook ID are encouraged to participate. International customers are welcome to participate but shipping will be additional and you can also add it free to your any pending orders. 1.) This giveaway/contest is void where prohibited by law. The contestants assume the total responsibility of knowing their local laws in regard to "10th Year Anniversary Special Giveaway" Contest and are subject to any local, state, national or international laws. Friendship Circle accepts no responsibility for making these individual legal determinations. 2.) Winner is solely responsible for any taxes on their respective prizes. Noodler’s Pens and Ink - May be this is all you need. Many of you have probably already heard of Noodler’s; whether it was the inks that attracted you, their new line of pens or their occasionally, infamous reputation; this company has been a constant presence in every pen enthusiast’s mind. The rest of you, however, have no idea who they are, so prepare to be amazed! The Noodler’s company is named after a sport played down South in the United States known as “noodling.” Those of you with southern roots know what I’m talking about, but if you are a cultural turtle on southern traditions, allow me to enlighten you. Noodling is a sport where the objective is to capture a live catfish. (Which is, as expected, Noodler’s logo.) What makes this sport different from fishing, you ask? Well, when noodling, you have to use your bare hands! Noodling enthusiasts feel this gives the catfish a fighting chance. This idea is what The Noodler’s Company is all about: giving you a chance to get a quality product at a fair price. If there was ever a controversial company in the world of luxury stationary, Noodler’s Ink would be that company. From its genesis, the American-born company had a lot of competition from its oversea cousins Namiki, Faber-Castell and Lamy and even its homegrown siblings Cross and Waterman. All of these companies have a steady fan base, and their own individually cultivated reputation and image. Those who have experienced Noodler’s Ink’s…ink, however, have always been in conflict about whether they actually like it or not. 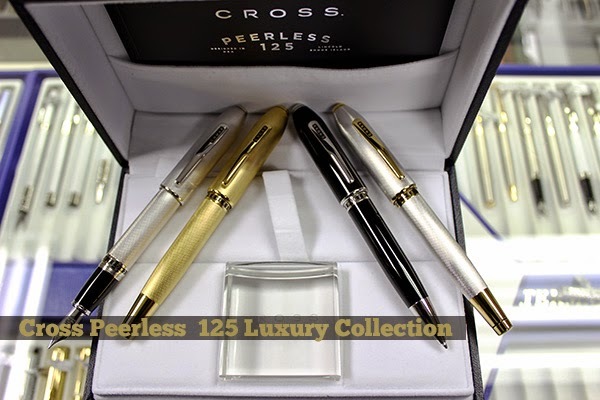 The company has a tendency to be inconsistent in the quality of its pens and this unreliability has turned many enthusiasts away from the brand. Now, before you get out your torches, let us evaluate Noodler’s Ink fairly. While the Pen Boutique has carried Noodler’s Ink’s ink, carrying their pens always seemed like it would bring about a Schrödinger’s Cat scenario (And frankly, whether the cat – or pen, in this case – is “alive” or “dead,” it will always be a stressful situation for everyone involved). For a long time Pen Boutique never carried Noodler’s Ink’s pens, and it ultimately seemed like a good idea. However, ever thoughtful of our public, it was decided that going out of our way to listen to the requests of the more than 40% of customers who genuinely like Noodler’s Ink’s pens, regardless of their indiscriminate effectiveness. Though they are a minority, Pen Boutique listens to each and every request sent our way. Even if uttered by a single voice, we pay attention to our customers and try to give them the best experience imaginable. The Noodler’s company has a past decorated with extravagant inks of different shades and qualities. The list of products is so extensive that a classification system had to be developed. The “Freeze Resistant” class resists freezing temperatures far below zero; the “Eternal” class resists the hardships time such as moisture humidity and UV light; the “Bullet Proof” class is capable of resisting all known tools of forgery such as, carpet or oven cleaner, bleach, UV light wands, solvents, petrochemicals, and even water! Interestingly enough, these classes are not set in stone. Inks can be grouped in multiple classes, such as being Freeze Resistant and Bullet Proof. (Very useful if you ever become a top secret agent and have to fight Russian spies. Or if you’re just a careful person and live somewhere cold, but the former reason is much more exciting.) All of the inks are made from a special cellulose reactive substance developed in Rochester, New York. They are all also, for the most part, waterproof, so their properties remain even when dried. The ink can be reconstituted with simple tap water! How’s that for convenient? That’s enough about Noodler’s already well-known inks. Let’s move on to their pens. Their newest line includes treasures such as the Piston Fill Resin fountain pen, the Noodlers Ebonite fountain pen, and their roller ball counterparts. The Piston Fill Resin has an extremely classical and traditional look. It possesses a bow windowed ink chamber design that is similar to pens of the 1960’s. The piston seal is made of a unique type of nylon, which is the same material used in high-end piston fill pens. The Noodler’s Piston Filled Resin fountain pen is made from a celluloid derivative, like the inks, and boasts a variety of colors including: black, red, orange, turquoise, burgundy, and navy blue. The two fountain pens also possess a rim band that protects the ebonite from the damages of long term use. The Noodler’s brand Roller Ball pen is made with an ebonite feed system, much like the other two fountain pens. The design was inspired by an 1870 style with a fine ball tip. These pens and inks are cost effective, water proof, and revivable if dried. However, the inks cannot be mixed with other, more “conventional” inks. This will cause the special properties in the Noodler’s ink to become inactive, but with the things these inks do, who needs another kind of ink? The Noodler’s ink should not only be kept away from other inks, but you should also be wary of which types of pens you put the ink in as well. There have been a few instances where the pen was bleeding through, and a few cases of nib creep. To these problems, my advice is to clean out your pen, if you have not done so already, or try the ink in another pen. If that doesn’t work then you should definitely call in and talk to Noodler’s customer service division. As a fun side note, I would like to point out the delightful names of the inks. “Habanero” is a deep sauce red named after the famous pepper used in southern dishes. “Polar Blue/Black” are named for their tolerance to extremely cold temperatures. Each of the Noodler’s Ink’s inks have their own unique name that adds a refreshing touch of flavor and individuality. The Noodler’s ink appears to pride itself on the life span of their pens and inks. This sense of pride is not misplaced, even though there may be a few hiccups. There is nothing perfect in this world, and with that in mind I’d say that for the most part these pens and inks are pretty fantastic. If you can get past the minor issues, which every pen goes through, no matter how high-end, then you will not regret it, and your enjoyment of the product will last as long as the ink does. I went pen shopping with my daughter and she fell in love with the Kaweco Sport pens. She is 5 and this series of pens are just her size. 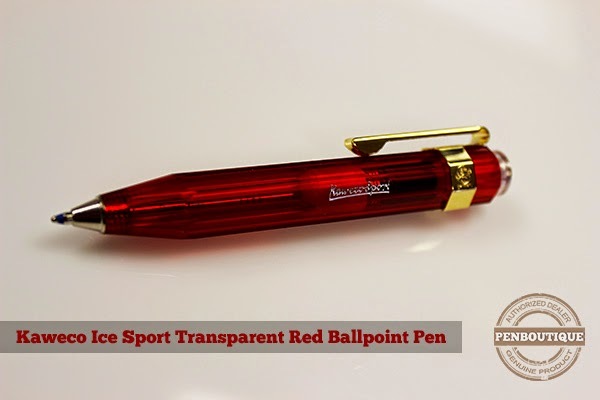 She went straight for the Ice Sport Red Transparent Ballpoint pen, since Red is her favorite color. The Sport series uses a standard mini ballpoint refill, so I can find the refills easily. The simple push button on the top is easy and smooth. The pen is a little over 4" long and about 1/2" wide. The octagonal shape prevents the pen from rolling off the table or desk. A clip is available, in gold or silver color. The Sport is available in a Fountain Pen, Rollerball, Ballpoint or Mechanical Pencil. Kaweco has been around for over 130 years and is based in Germany with retailers all over the world. The Sport series was first started in 1912 and is still popular today. Many of the Kaweco pens are less than $100.00, with the Sport under $30.00. Most recognizable by the signature white dot which adorns the clip, Sheaffer has long been a respected name in the world of pens. Sheaffer collaborated with famed US architect Charles Debbas to bring us the Taranis line of pens. Debbas has taken his characteristic feature – minimalism – and melded it into this line. The overall shape and design of the fountain pen when capped is the definition of minimal, with a rounded middle slowly shifting to squared ends on either side. The clip is rectangular and fits nicely with the aesthetics of the body. Uncapped, the user is greeted with a front section adorned with the Sheaffer name (hidden when capped, no doubt to keep in the vein of the minimalist aesthetics) and a hooded nib, which helps keep a tidy and simple appearance. The fountain pens are compatible with Sheaffer converters and Skrip cartridges, both of which are included with the pen. The Taranis line is also available in Rollerball or Ballpoint, and in five different colors – Stormy Night (black), Icy Gunmetal (grey) or Sleek Chrome (silver) with chrome trim, and White Lightning (white) or Stormy Wine (burgundy) with gold trim. The Sheaffer Taranis fountain pen is well balanced, and it felt most comfortable while using it posted. The nib is smooth – it reminds me of a Pilot/Namiki Vanishing Point both in feel and looks. If I were to nitpick, it does seem to be a little on the wet side with a Medium nib though nothing that would keep me from using it as a daily writer. The front section where the Sheaffer name is present is flat and I found it to be a good resting place for my pointer finger while in use. It is nice that a converter is included, as not all fountain pens come with one, especially as it is proprietary to Sheaffer pens. This is my go-to suggestion when someone is looking for an affordable pen as it blends great writing performance with modern styling. While it is aesthetically an unassuming pen, the Sheaffer Taranis is one of the smoothest writers I have used. If you are looking for an understated daily pen with a fantastic nib, the Taranis is hard to beat. In 1981, Sailor introduced their 1911 series as a celebration of the company’s founding in its namesake year. The line can be had in a number of different sizes, shapes, colors, and nib configurations. The 1911L, which stands for Large, is a step up in size from the 1911S (Standard) both in diameter and length. Other than the nib, clip, and decorative rings, the pen is made entirely of resin. This imparts a light weight that is easy to handle, even in this larger iteration. The 21k Gold nibs range from Extra Fine all the way up to Music, and includes Sailor’s Medium Fine for those that find the Medium too broad but the Fine too thin. The 1911 series traditionally uses either cartridges or a converter, though Sailor has recently created the piston filled Realo line. Both the cartridges and converter are proprietary Sailor designs, and the cartridges are available in Black, Blue, Blue/Black, Red, or Pigmented Black or Blue/Black. The pigmented inks are waterproof, but extra care should be taken when using these as the tiny particles that cause this characteristic may create issues if the pen is not used or cleaned regularly. In general, Sailor’s nibs tend to run a size smaller than a Western counterpart – i.e. the Fine writes like an Extra Fine, the Medium writes like a Fine, etc. In testing a Fine nib, I found this to be true as the pen laid down a very thin line. Despite the Extra Fine-like width, the nib was smooth, no doubt aided by the 21k Gold construction. The pen was comfortable to use both posted as well as with the cap left off – another advantage of the light weight. The larger size compared to the Standard version allowed for a solid grip without much effort, which is something I have come appreciate when having to write for long periods. I did notice that the nib had a little flex to it, lending a slight variation to line widths if I was so inclined. This led to a line that was more akin to a Western Fine. The 1911L looks good and writes well. Sailor has done a fantastic job in creating a piece that is large enough to use comfortably yet light enough to not fatigue your hand while doing so. If you are looking for a thicker pen with a smooth nib and classic good looks, the 1911L should definitely be at the top of your list.